Editor’s note: The world of weed is growing every day. Here’s a compendium of marijuana terms and definitions, from the plant, to concentrates, vapes, pot culture and beyond. 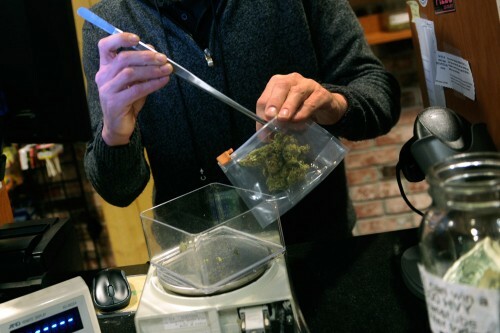 Alcohol extraction — This method uses alcohol (preferably pure ethyl alcohol, but also isopropyl) as a solvent to strip cannabis of its trichomes and essential oils. After washing the plant material, the remaining alcohol is evaporated off, leaving behind a golden hash oil. Further processing via heat, agitation, or vacuum pressure will aid in removing any residual alcohol from the oil, which is essential prior to smoking, as well as result in different textures (shatter, budder, or oil). Blunt (see also: Dutchie) — A hollowed-out cigar which is then rerolled with weed; the name originally came about because the most commonly used brand of cigars were Phillies Blunt. A blunt only becomes a “Dutchie” when it is rolled using the Dutch Masters brand of cigar. A newer (and many argue less authentic) version utilizes a specially-made rolling paper called a “blunt wrap” rather than a cigar; these wraps come in a huge variety of sizes and flavors. Blunts are known for being very long-lasting and thus suitable for parties, often burning for a half an hour or more. Tobacco-avoiders might want to pass on the blunt, as they do have some nicotine content due to the tobacco wrapper, which adds to the effect for many nonsmokers. Blunt wrap — Specialized rolling paper made of tobacco which mimics the more traditional hollowed out cigar method of rolling blunts. These wraps come in a wide variety of sizes and flavors. Bogart — One of pot lore’s most ancient of verbs, used when someone is taking entirely too long to pass the joint or have taken more hits than is allowable. 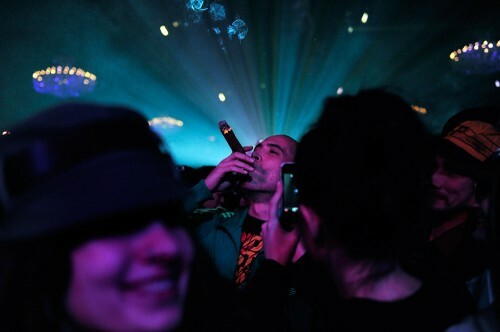 “Puff, puff, pass” or risk becoming the much-maligned Bogart of your social circle. Bongwater — The foul-smelling, sewer-like liquid sloshing around at the bottom of a water pipe or bong (which you really need to change, by the way). Bored stoners in the past have tried drinking it to get even higher, which is not recommended. Bowl — Also a unit of measurement (i.e. “spot me two bowls”), a bowl is the part of the pipe or bong where you put the weed. Bubbler — A handheld pipe (normally made of blown glass) that has a water resevoir at the bottom, which helps to cool the smoke and makes for a smoother hit than a dry pipe. Bubblers are the middle ground between a traditional pipe and the larger, less travel-friendly bong. 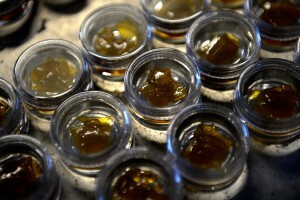 Budder — Another term for the opaque form of hash oil. The difference between wax and budder is subtle, but generally, budder is a softer, pliable product (like softened butter at room temperature) while wax trends more towards the crumbly side. Buds — The dried flowers of the cannabis plant. Ideally, buds should be well-trimmed, dry enough so that the stems snap, and cured for a couple of weeks prior to being smoked. Butane hash oil (see also: “BHO, budder, crumble, dabs, earwax, errl, honeycomb, honey oil, live resin, oil, pull ‘n snap, sap, shatter, taffy, wax”) — A non-polar hydrocarbon which is used as a solvent in many other industries such as essential oil extraction, butane is especially well-suited for stripping cannabis buds or trim of their cannabinoids, terpenes, and other essential oils while leaving behind the majority of unwanted chlorophyll and plant waxes. Home manufacturers generally use a glass or steel tube and lighter fluid-grade butane (yes, it’s a risky process), while commercial producers rely upon expensive, “closed loop” extraction units and high-quality n-butane to perform butane extractions. With either method, the solvent washes over the plant material and is then purged off from the resulting solution using a variety of techniques and variables such as heat, vacuum and agitation. These post-extraction processes also determine what the final texture of the product is, whether it be budder, shatter, or a more traditional sticky hash oil. Routinely testing at over 60% THC, BHO is the most popular choice for “dabbing” — when well-made, it offers a very potent, direct, and flavorful method of ingesting cannabis.